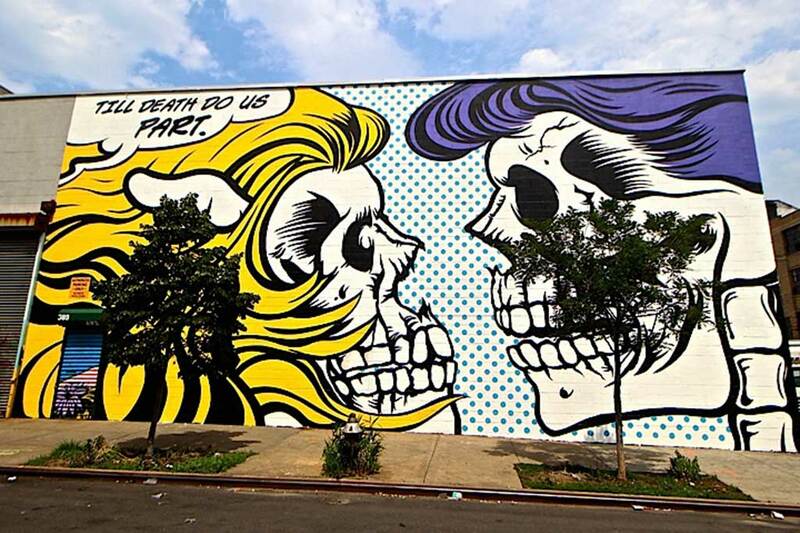 Drawing inspiration from New York’s pioneering graffiti scene of the 1970s and ’80s, British street artist D*Face has painted walls all over the world with his incisive, Pop-inflected murals that critique the modern world, in particular consumerism and the American Dream. In past works he has appropriated familiar cartoon figures such as Mickey Mouse and Hello Kitty—dissecting them with images like skulls or economic signifiers—and created portraits of icons like Jimi Hendrix and Kurt Cobain. “Thematically my work always draws upon personal experiences, whether that’s the saturation of media in our lives, our fascination with celebrity and stardom or more singular experiences such as the loss of loved ones,” D*Face says. Although he has increasingly shown at galleries, he approaches these sites with the same anarchic energy as his in situ works in public spaces.